The Phoenix, like the bird Feng, is a mystical bird said to live 500 or 600 years and then to build for itself in the desert a funeral pyre of dried grasses and sweet spices. To this it sets fire by fluttering its wings whilst hovering over it, is then consumed, but from the ashes it rises again renewed in youth and in its gorgeous plumage; an idea appropriated by old-established fire insurance offices, the symbol of which is familiar to all. The Phoenix is believed by the Chinese to uphold their Empire and preside over its destiny; it is also worn as a Talisman for Longevity and Conjugal Happiness; whilst in the mystic sense it typifies the whole world, its head the heavens, its eyes the Sun, its beak the Moon, its wings the wind, its feet the earth, and its tail the trees and plants. To the Japanese the Phoenix, or ho-wo bird, is a Talisman for Rectitude, Obedience, Fidelity, Justice, and Benevolence, and they consider it a manifestation of the Sun, its appearance on earth being considered a portent of great events. The torii, a kind of gate elaborately carved and decorated at the entrances of Shinto temples, is erected for the Phoenix to perch upon should it visit the earth (see Illustration No. 40, Plate III). This fabled bird has also played a conspicuous part in British and foreign heraldry. The Dragon is symbolical of everything imposing and terrible, and forms the Imperial coatof-arms; the Emperor's throne being called the Dragon One. There are three forms of Dragon - the "Lung," or sky dragon, the "Li," which lives in the sea, and the "Kiao," which inhabits the marshes. The dragon is worn for Longevity and Domestic Felicity (see Illustration No. 38, Plate III). The type of the Dragon was thought to have been the boa-constrictor, until the researches of geology brought to light in the iguanodon such a near counterpart of the dragon that this is now regarded as more probably its prototype. The Lung is represented as a dragon-headed horse which carries on its back the book of the Law. It is very popular in Thibet, where it is known as the Wind Horse; but the Lamas have substituted for the book of the Law the emblems of the three gems (see Illustration No. 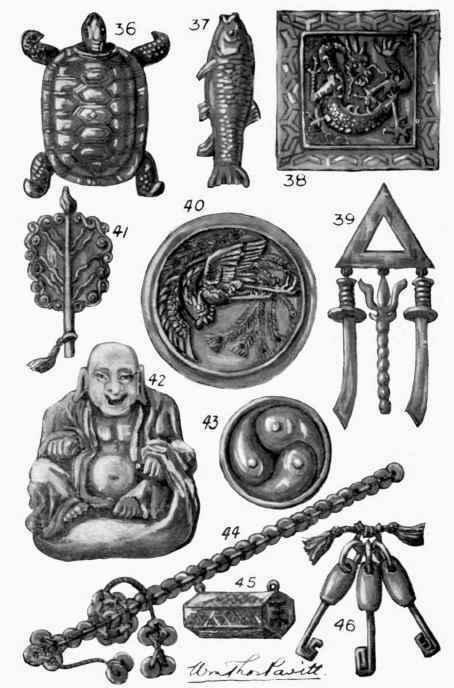 31, Plate II), which include the Buddhist Law, and is thus worn by the Thibetans to bring material gain, wealth, and good luck; in this form it is painted on luck-bringing flags, which are hung from the ridges of the houses and in the vicinity of dwellings. The all-potent horse-shoe is not used by the Chinese, but the hoof of a horse has to them the same preservative virtue as the horse-shoe with us. Another charm extensively used in China amongst women, is a small gold or silver triangle bearing two swords suspended from the outer angles, and a trident from the centre of the base; on the triangles lucky-characters frequently appear (see Illustration No. 39, Plate III). This is undoubtedly an imported Hindu Talisman of Siva, who is regarded as the Regenerator and Controller of reproductive power; and in addition to the acquirement of these qualities, this Talisman is worn for protection against Ghosts and Goblins who are under the control of Siva, and written charms of triangular shape are frequently made for this purpose.